Canine cancer is similar to human cancer in that it typically progresses through a series of stages, from I to V. In addition to its stages, cancer is defined by grades, which indicate how aggressively the disease is behaving within the dog. 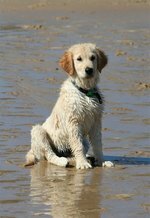 The end stages of canine cancer can be difficult for the dog's owner to witness, as they mark the end of their pet's life. A woman is petting a sad looking Dachshund. Most canine cancers are marked by four stages; however, some cancers add a fifth. Stages are marked by the growth and expansion of abnormal cells throughout the dog's body. In contrast, cancer grades mark the aggressiveness of those cells, the speed at which they grow. Stage IV cancer is marked by a large number of abnormal cells that have progressed beyond the area of origin, such as breast cancer entering the bones or lungs. These metastasized cells form tumors that may not respond to treatment or surgery. Dogs with Stage V lymphoma have systemic involvement of blood, central nervous system and bone marrow. Dogs in the later stages of cancer typically cannot be cured or brought into long-term remission. Radiation and pain medication are the typical modes of treatment for these stages. Lymphoma and hemangiosarcoma are incurable. Bleeding during stage V lymphoma can be profuse and either internal or external. It should be considered a crisis for which the veterinarian should be consulted. Marvistavet.com describes hemangiosarcoma as being "a malignant tumor of blood vessel cells," which forms blood-filled tumors that may break open. Hemangiosarcoma affects several organs, including the skin, heart and spleen. Hemangiosarcoma of the skin can be controlled by surgery, followed by chemotherapy. Dogs treated with surgery or chemotherapy alone typically have life expectancies not exceeding 90 days. A combination of the two extends life expectancy to up to 200 days.